Downsize Diary: Weeks 6,7,8,9 ……..
Downsize Diary: Weeks 6, 7, 8, 9 ….. Where does the time fly? Can’t believe that we started this de-cluttering and downsizing process when the Olympics were on. BUT, and a big BUT, it’s worked. All that hard work, painting, throwing out and cleaning has really worked. We have sold our house, within 5 weeks of it being advertised for sale. Erik and are are so thrilled, and so grateful to our Estate Agent, Philip Bannister, and all his company. Luckily for us, we don’t have to move out before Christmas, and we are now frantically trying to find a house and garden that suits us. We have scoured the East Yorkshire, North Yorkshire, South Yorkshire and Lincolnshire countryside, seen so many houses it is difficult to remember each one’s details, and finally decided that instead of trying to be nearer to our 5 grandchildren, it would make sense to find an area that makes us feel happy. Let’s face it, both my sons and families may suddenly decide to emigrate to Australia or Canada, and I wouldn’t blame them if they did. The world is a much smaller place now, and Skype can help keep us all in touch. But if they stay here, all the children are either in school or will start in 2 or 3 years, so grandparents will, no doubt, be called on to entertain them in the school holidays. So, what better than the East Yorkshire seaside town of Hornsea. 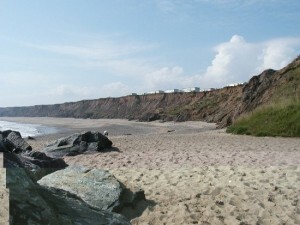 Hornsea also has one of the largest lakes in the country, Hornsea Mere, which is just stunningly beautiful, and a wonderful place to learn about boats, or take the grandchildren to feed the hordes of swans, ducks of all shapes and sizes and just enjoy the landscape. 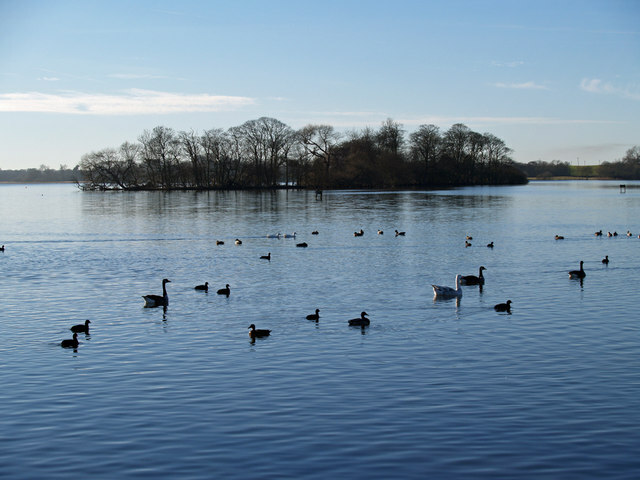 Hornsea Mere – just plain beautiful. So our search is continuing. We’ve looked at big houses with small gardens, small houses with big gardens, and come to the conclusion that not many of the houses really do look as nice as they appear in the brochure. Is it just me? Panic may be setting in soon, as we do have to leave our lovely house after Christmas, and if we don’t find our downsized dream home in Hornsea, we may have to rent – the problem being we have our 2 big Airedale dogs and a very furry timid pussycat to take with us. Ah well, nil desperandum! What will be, will be. So, whatever happens, the next few weeks will be sorting, throwing out, giving away or packing. Erik, of course, is dropping big hints that I must get rid of all my precious things (or as he calls it ‘rubbish’) that I’ve tucked away in cupboards all these years – ‘just in case’ objects – but I’m insisting that until I know the size of house we are going to be living in, a lot of things are coming with me. Meanwhile, I’m perusing all the oven and fridge websites, not to mention the seed and vegetable catalogues, keeping the dream of both a great new kitchen and another Kitchen Garden to create. But lets face it, I must prioritise – where do you find buckets and spades in winter? And whilst we are at it, anyone for packing? One Response to Downsize Diary: Weeks 6,7,8,9 …….. Yes – I’ll help with anything as long as it is after Christmas. Well done on finding your house.